The open floor plan has become a standard design in the modern home, and it certainly has its good points. Our great-grandparents homes were built with small separate rooms, each with its own purpose. This was partly the result of the current style, and partly from necessity due to the building materials available at the time. Stronger and more compact modern building materials have made the “great room” a possibility, even in modestly priced homes. We enjoy the space and feel of an open floor plan, and we get giddy at the thought of lots of windows, but there are times when we think our great-grandparents had it right. There are times when dividing a room into more private sections is preferable, and in the absence of walls, this can be accomplished with room divider curtains. Ceiling-mounted curtain tracks are the only way to create a virtual wall via room-divider curtains. Rods simply will not get the job done. We have several tracks that work well for this application: the 88001 Privacy Curtain Track, the 3118 Ceiling-Mounted Aluminum Track, the 3120 Heavy-Duty Track, and the 6100 Flexible Curtain Track. These tracks can be installed directly into the ceiling (some can even be recessed) or hung from a drop ceiling using clamps. Whatever track you pick make sure to order the drapery hardware available on the same webpage, as these carriers and hooks will be compatible with your track. Once you’ve picked your track it is time to pick your curtain, and you’ve got lots of choices. Will you go with a floor-to-ceiling sheer for an airy, ethereal look, or will you purchase our Eclipse light blocking and sound absorbing curtains to completely shut out the world? Decorative curtains can be used anywhere and for almost anything: you can create an intimate dining experience, section off the TV-viewing area, create peace in your kids’ room by dividing it down the middle, or…you tell us! 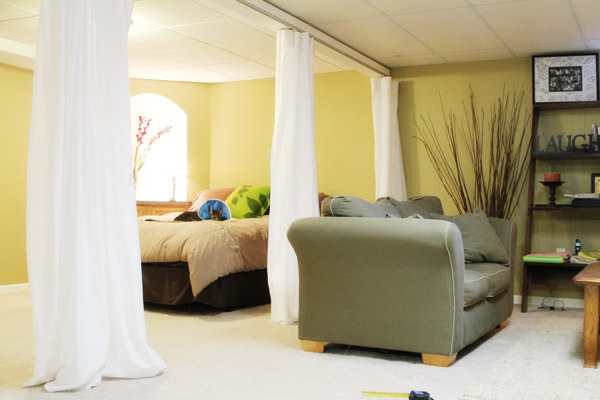 How have you used room-divider curtains in your home? Send us your photos at info@curtain-tracks.com.